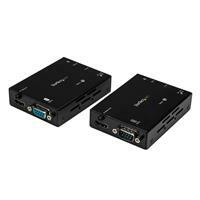 This HDBaseT™ extender kit can transmit your 4K HDMI signal up to 115 ft. (35 m) over a single CAT5e or CAT6 cable. At lower resolutions up to 1080p, the extender kit can transmit your signal up to 230 ft. (70 m). The extender offers a complete end-to-end video and control solution, using HDBaseT technology to extend not just HDMI, but also DC power, IR and serial control over a single CAT5 cable. By extending so much over just one CAT5 or CAT6 cable, HDBaseT is the clear choice of every integrator and system designer. The added benefit of power over cable means that you’ll only need one power source at one side of your extension - great for extending video and control to areas where power outlets may be limited, such as industrial sites. Serial and IR extension optimizes operation by enabling you to control the video source or display from both the local and remote location. This HDBaseT extender has been certified via the HDBaseT Certification Program. This certification ensures the extender is compliant with HDBaseT technical standards, and maximizes reliability with your HDMI display and video source, by ensuring compliance with their established HDMI ecosystem. With the A/V industry adopting 4K as the new high-resolution video standard, long-range video distribution can be a challenge over standard HDMI cables that become susceptible to signal degradation at 30 feet. This HDBaseT extender can maintain your Ultra HD 4K picture quality - four times the resolution of high-definition 1080p - even at 330 feet away from your video source. Plus, because the extender supports high-definition 1080p and lower resolutions, you can comfortably use this extender to make any video source look great, while future-proofing your setup for 4K implementation. HDBaseT technology offers a single-cable installation, so you can integrate this solution seamlessly using your existing CAT5e or CAT6 infrastructure. Both the transmitter and receiver included with this HDBaseT extender kit are mountable, so you can keep the equipment out of sight in an equipment rack, or on a wall. This helps to reduce clutter and ensure a professional installation that doesn't draw your viewers' attention away from the content on your display. It’s perfect for customer-facing displays in bars, restaurants or hotel lobbies. HDBaseT is a standardized, zero-latency video technology that’s revolutionizing HDMI distribution. HDBaseT uses an advanced method of modulation that enables you to distribute uncompressed HDMI audio and video, along with additional signals, over a single Ethernet cable. Offering greater versatility than traditional HDMI extenders, and longer distances than HDMI cables alone, HDBaseT is the clear choice for every integrator and system designer. It can do so much, with just a single cable. The ST121HDBTL is TAA compliant and backed by a 2-year StarTech.com warranty with free lifetime technical support. 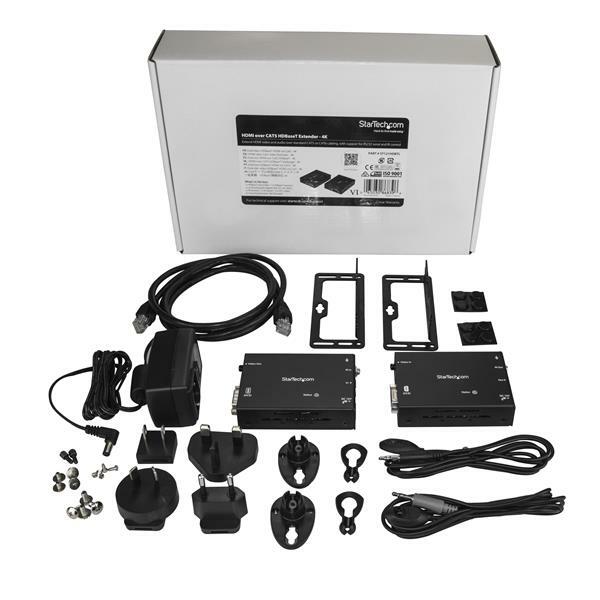 Note: When using Power over Cable (PoC) to power the transmitter or receiver, it is not recommended to pair the StarTech.com transmitter or receiver with any other HDBaseT hardware. Power over Cable should only be used with the transmitter and receiver that are provided with this extender kit. Note If you want to add more displays, you can daisy chain this product with the HDBaseT repeater ST121HDBTRP. My display is blank when running at 4K. How do I fix this issue? This device supports up to 4Kx2K resolutions @30 Hz with a color depth of 8 bits. If you are running a 4K resolution at a refresh rate higher than 30 Hz or a color depth higher than 8 bits, your display will appear blank. Connect a display to OUT 1 that is only capable of 4K at 30 Hz with a color depth no higher than 8 bits. Connect the least capable display to OUT 1. Connect an additional display to your video source (for example, a video card in a computer) and use this display to reconfigure the display connected to OUT 1 to run at 30 Hz and 8 bits color depth (or lower).